If you haven't already bitten the bullet and taken your unlocked iPhone down that scariest of paths, the 1.1.1 update, we're here to sort out a bit of the hearsay from the actual and fairly inconvenient truth. Even if you have already updated, or never even unlocked or jailbroke your iPhone to begin with, there's still a lot to learn, so let's dive in, shall we? Most people with a jailbroken iPhone will end up with a "factory-fresh" iPhone after the 1.1.1 firmware update. Your mileage may vary, and isolated incidents of bricking have occurred, but most people are just going to have a 3rd party-free, AT&T-only iPhone in their pocket when the day is through, and bricking seems to be just as common for a virgin iPhones as for jailbroken ones. As for when we'll have full use of the iPhone again is unclear, but TUAW's Erica Sadun says "don't expect a jailbreak anytime soon," which doesn't seem promising. Apparently the security is going to be a whole lot harder to crack this time around. 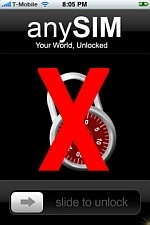 As for unlocked iPhones, you should probably hold off for the time being. The most serious problems we're hearing so far relate to iPhone Dev Team's anySIM unlock, which has left some iPhones "bricked" with an "Incorrect SIM" error message (seen above). That's not to say a workaround won't be found in the future, but for now anySIM users should certainly stay away from 1.1.1. SuperSIM and TurboSIM users are also advised not to update, but we have less solid info about that. iPhoneSIMfree users seem to be in fine shape as long as they're rocking an AT&T SIM card -- though that does seem to defeat the purpose of an unlocked iPhone in the first place. Please let us know about your personal experience with the update on an unlocked phone so we can get a clearer picture of the exact damage, but it's probably best for you to restore your phone to to a factory state before 1.1.1 rather than risking it all for our benefit. Update: We've heard that iTunes 7.3.1.3 can restore a bricked phone with the 1.1.1 update. No confirmation yet, but feel free to let us know if it works for you in comments. Still, there are still plenty of ways you can stick it to the man. For starters, don't upgrade to 1.1.1! There's no telling when the iPhone will be re-hacked at all, and if you're interested in running 3rd party apps or using a non-AT&T SIM then 1.0.2 is where it's at for the time being. If you do feel like sending your pre-1.1.1 iPhone back to a "virgin" 1.0.2 state, there are methods for doing so that will give you a fresh iPhone with all sorts of unlocking and jailbreaking potential, along with providing the "safest" state for your iPhone to be in before a 1.1.1 update if do you choose to perform one. If you are staying away from 1.1.1, naturally be careful to reject any of iTunes' friendly offers to update your phone, and it can't hurt to disable "Check for updates automatically" in iTunes preferences. Apple won't be "pushing" the update on you, so if you do run it and break something, it's your own dang warranty-voiding fault -- though jailbreaking doesn't actually modify anything beyond your software, so you shouldn't have much to worry about as long as Apple doesn't decide to get nasty. However, should you happen to ignore all these dire warnings and brick your phone in the process, there are reports of Apple Geniuses unbricking iPhones at Apple Stores, despite warnings posted to the contrary, as long as that phone hasn't been unlocked. Even if you have unlocked, it can't hurt to ask, so keep your fingers crossed and hope for the best! There are also still ways to add your own homebrew (read: free) ringtones to your 1.0.2 iPhone, even when running iTunes 7.4.2. Just pick your poison: iPhone RingToneMaker (Windows), Ringtonator Studio (Mac), or iToner (Mac). Sadly, iToner developer Ambrosia Software says that 1.1.1 breaks this hack, but they're working on a workaround. Before we go, we'd be lying to you if we said there aren't some legitimate reasons to upgrade, so we'll run them by you real fast -- just in case you needed any more reasons to be conflicted about updating your iPhone. This article liberally sourced the fine folks at Hackintosh, TUAW and the iPhone Dev Wiki. Header image is courtesy of Josh Bancroft, and the chart is courtesy of Wired's Gadget Lab and 9 to 5 Mac.